There was Back to the Future fever on Tuesday night as 25 DeLorean cars rolled up for a special back-to-back showing of the films. The event at the UCI Cinema in Basildon, Essex, was to celebrate the 20th anniversary of the first film's release in 1985. The DeLorean won cult status as a time machine in the films. 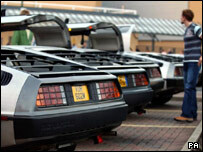 To mark the anniversary, members of the DeLorean Owners' Club UK took their vehicles along to the screening. Organiser Kevin Milliken said: "People are coming from all over the country with their cars. There are about 100 DeLoreans in Britain, so this is a great turnout. "I think it is probably the largest number of DeLoreans ever in one place in the UK. "They are wonderful cars and really nice to drive." The cars were made by the American car-maker John DeLorean, who died aged 80 in March this year. Manufacture began at Dunmurry near Belfast in 1981, with fewer than 9,000 cars rolling off the production lines before the firm collapsed in 1982. Despite the company's failure the car, with its unpainted stainless steel skin and gull-wing doors, gained a cult following after appearing in the Back to the Future films.